I’m addicted to coconut, combine that with mango and I’m in heaven! 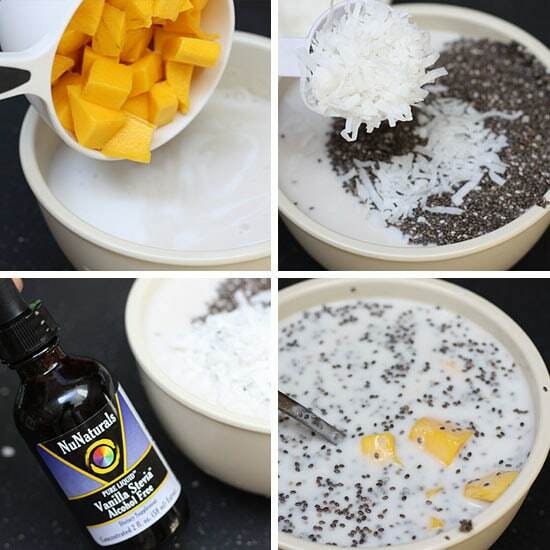 And, using chia seeds make an easy, healthy pudding which requires no cooking! Genius! 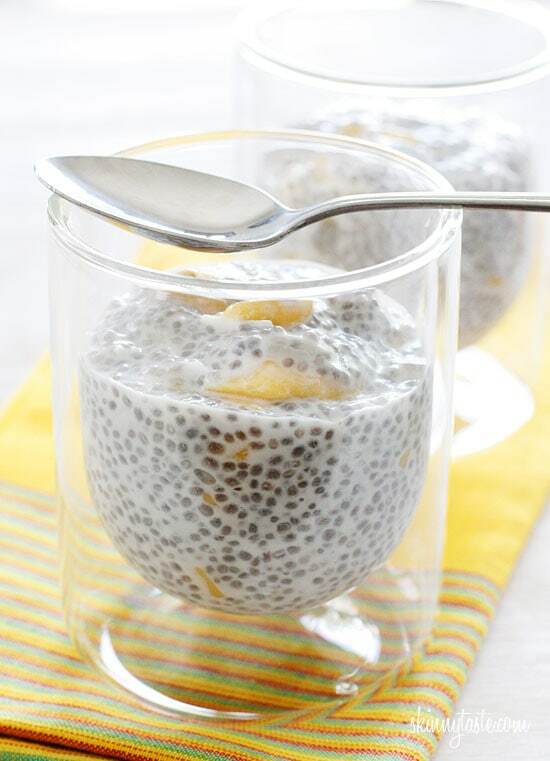 I absolutely love chia pudding for dessert and sometimes even breakfast. Some of my other favorites are Superfood Triple Berry Chia Pudding, Coconut Lime Raspberry Chia Pudding, and even Raspberry Coconut Chia Pudding Pops! 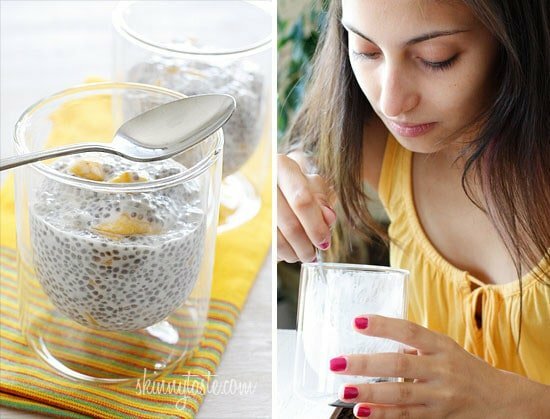 Chia pudding has a sort of tapioca texture, you simply combine all the ingredients and refrigerate overnight. The little tiny chia seeds when soaked in liquid expand to more than 4 times their size! They don’t really have much of a taste, the texture is similar to passion fruit if you’ve ever eaten one. And in case you’re wondering, yes it’s the same chia seed used to make Chia Pets. Chia is an excellent source of omega fatty acids and full of minerals, vitamins and fiber. Aside from making pudding, you can add them to smoothies, muffins, and my favorite, I throw them in my bowl of cereal. Tested this pudding out on my pickiest family member, my teenage daughter Karina and she LOVED it to my surprise, she usually puts her nose up at some of my healthy creations. What do you do with your chia? Would love to hear! Divide into 2 bowls or glass dishes and serve. Enjoy! Super-delicious, but I should have read the comments first. My app also calculates 5 points and I’m over budget now. It was worth it, but I need to pay more attention to the points from now on. OMG! Just made this and used recipe builder for Freestyle points and it came out to 4 points. Perfect! This is so delicious! It will be on my regular rotation of breakfast and snacks. Once again, thanks Gina! All of your recipes are easy and so delicious. How much honey would you use in place of stevia drops? Why was my mixture al liquid? It didn’t firm up all? Thanks. Perhaps you like it thicker? If so add more next time. I put it in my oatmeal with unsweetened almond milk, cinnamon, sliced almonds and a Banana. Sometimes I add a tablespoon of natural peanut butter for sweetness ? How are you getting your points? I’m allergic to tree nuts….what can I substitute for the almond milk? Thank you! Any substitute for the almond milk? I’m allergic. Use whatever milk you normally drink. I love chia seeds. I put them in my salads and ive made the chia pudding but my favorite is…..take 1/2 cup unsweetened 2% plain greek yogurt add some unsweetened jello powder your choice of flavor….i love black cherry…..add 1 tbsp of chia seeds and mix. I sometimes add some protein powder……yum. I add chia to my eight glasses of water a day with a little lime juice. I don’t like drinking plain water and this has helped me get to my 8 a day. I am not sure these Smart Points are right. When I put it in the ingredients into WW recipe builder come out to 10 points. Am I doing something wrong? Even if I enter the nutritional ingredients above, I come up with 7 and that is using 0 saturated fat. So I tried this a few weeks ago and absolutely loved the taste–sweet, but creamy-just delicious! However, this did not turn into anything resembling a pudding…it was very “soup’y.” Any suggestions? I made a batch last night and this morning it was still not the consistency of pudding. Any idea why? I made this last night and the chia seeds did not absorb the liquid at all. Any thoughts on why? I was so disappointed! Wow, this is my new go to dessert. Its December so I don't have mangos but I topped mine with chopped pineapple and toasted coconut chips. I also used maple syrup instead of Stevia and added a little vanilla extract. An incredible healthy dessert. Thanks for the recipe! I used all coconut milk and I must have mis-measured, I left it overnight and it came out really soupy (mind you: a delicious soup but soup nonetheless). I just mixed in another T of chia seeds and put it back in the fridge, will check on it in a few hours. I also tried to add a bit of honey since I hadn't added any sweetener when I first made it. You want to know what honey doesn't like? Cold soup, it coagulated on the back of my spoon. Not giving up yet, hopefully in a few hours it'll look more like it should, can't wait! I use Sandi Krakowski's recipe for Chia Pudding. P.S. Yummy!!! I love to have chia pudding for breakfast. Chia also help with bloating. I put 2 tbsp in a glass and fill with water than put in fridge and before you eat foods that make you bloat mine happens to be pears take a tablespoon of this. so is one serving equal to one cup, therefore a jar of this dish is 159 calories? or is one jar 159×2 calories? do you use coconut milk from the carton in the fridge or coconut milk in the can? Here in Costa Rica the favorite seed is chan. I have a feeling it's a relative of chia because it expands the same way. They just started selling chia here, but I'm going to give it a try with chan first, since it's a whole lot cheaper. Made this about 24 hours ago and just tried it now. Hubby liked it but said "it … looks … weird." This is our first attempt at Chia anything but won't be the last. I followed the recipe as is with the addition of freshly grated ginger root and instead of stevia used about 2 teaspoons of ginger syrup. Great flavor and texture! Coconut milk would taste nice and i imagine would do the same thing. My mixture did not set after being in the fridge over night. Is there a reason for this? Or how do I fix it! Toasting the coconut gives it an extra yum! I made this last night and had it for breakfast this morning. My 18 month old daughter loved it! My husband really enjoyed it as well. I made it again right now so we could have it for breakfast tomorrow. I didn't have fresh mangos on hand, so I used some freeze dried ones I had. I increased the milk to compensate for the dried fruit. 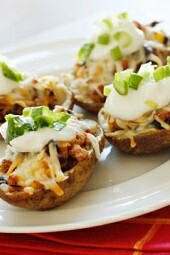 This is an excellent recipe, very filling and very flavorful!!! Thanks so much!!! Wow, great and looks very easy to prepare…I like it! Just bought a huge bag of chia seeds at Costco, thabks for the recipe! can i use any kind of milk? can't wait to try this out! Finally trying these Chia seeds, but have only tried it sprinkled on my salad at lunch time. I would love to try this recipe, but I just don't like coconut 🙁 How will this taste without the cocunut? Do you have any other suggestions? Hi, Gina–this was fantastic! Thanks for introducing me to chia. I now want to put it in/on everything. Though it ups the point value, I used half almond milk, half Mango Nectar (the kind from Costco). It was awesome! I love Skinny Taste because your recipes are easy, healthy, and always incredibly delicious. I can't tell you how much I appreciate the hard work you put into your blog and recipes. You are awesome! So, after reading your recipe I have to buy chia seeds. i never tried them before but after finding a cia seed recipe every now and then on pinterest I have to give it a try! I made this last night, it turned out delicious but was runny and the chia seeds didn't seem to plum up as much in the picture. The only thing I did differently was used blueberries instead of mango and I didn't use shredded coconut,because I don't like it. Is there a reason why it isn't setting. I just mixed this together and can hardly wait for it to set up! I used skim milk, frozen raspberries and honey. I thought of putting half milk and half Greek yogurt….maybe next time…or maybe I will make two batches now and see which I like better in the morning. I am making this now, with the trader joes lite coconut milk. Is that the right milk or the the coconut milk beverage? I just made this but with 1 c. almond milk (instead of 1/2 c. almond milk and 1/2 c. coconut milk) and used a banana instead of the mango. I added a dash of vanilla extract and 1/2 T of sugar. It's been in the fridge for a couple of hours & I just had to taste… so delicious…had to stop myself from eating the whole thing right there! I guess it will be even better in a few hours! Thanks for the recipe!! is this thick or runny? I've tried a cup of almond milk with 2 TBSP chia seeds and put it in the fridge over night. It did get some gelatinousness to it, but not really like pudding, more like "bubble tea"
I'm enjoying your site … thanks for sharing! This looks yummy! I may try this using jarred peaches with a few sprinkles of cinnamon. I only have frozen mango chunks … I may make your popsicle recipe, too. It might be embarrassing for me to admit exactly how many times I've made this bowlful of heaven in the last few months…truly too many to count! I can't get enough of the tropical flavors, even with the brisk approach of fall. I've substituted a full cup of coconut milk (think Silk or So refrigerated coconut milks) in place of the lite coconut milk and almond milk. I think the coconut flavor reaches full potency and heavenly status with this adjustment! Wow, ok, thats a lot of comments to wade through to see if someone else asked my question So i'm going to just ask! We are going on vacation this coming week and I'm wondering approximately how long you thought this pudding would last. What i mean is this: We're leaving on Wednesday driving 10 hours and spending a week with family. Soooo, if i make some, say tuesday keep it in the cooler, do you think it would be good for a few days? i'm thinking yes, but just wondered if you had any expeirence with the aging process of such deliciousness! Thanks! This was quite yummy! I had only dried mango so I added a little more coconut milk. After sitting overnight the mango was juicy and tender. I think many fresh or dry fruits would be tasty in this recipe. The texture and sight of the finished product might take a little leap of faith to try but I really enjoyed the result. This is shockingly AMAZING. I made your italian wedding soup for dinner last night and whipped this up as "dessert". I used 3 cups of sweetend coconut almond milk, and just one packet of splenda because the milk was already sweetend, added a sprinkle of coconut flakes and sliced up 3 peaches, which 6 tbsps of chia seeds. I cannot tell you how much my family LOVED THIS! My mother was so impressed! I love your site and have been making so many of your recipes! Thank you for introducing me to a new way to use CHIA! This is my favorite new treat! I just made this (kind of) using soy milk and raspberries. So yummy! I didn't expect to like it that much. Even my male roommate who is usually pretty against anything really healthy liked it! Thank you so much for the idea/ measurements. I can definitely see myself making all kinda of different combinations, which is good because I bought a huge bag of chia from Costco! Is coconut milk even the light one not very high in points? Could I use just plain milk instead? Would cooking it destroy the nutrients in the chia seeds? You can use whatever you wish but I prefer the flavor from the canned. So delicious also has a coconut milk I recently tried. What is the texture like? Mine is still very watery after soaking all night. 🙁 It looks like a drink with fruit chunks. Something went wrong. I hope your seeds aren't ground. They should plump up in a few hours. What kind of lite coconut milk did you use? I use coconut milk daily in cereal/smoothies, etc. since I'm lactose intolerant and coconut is supposed to be so good for you, but I just use So Delicious or Silk versions, which aren't available as lite. I made this a few nights ago with Silk coconut milk and it was delicious, similar to tapioca in texture but better! Thanks for another great recipe! I used the canned one. I wanted a noticeable coconut taste. just tried Chia pudding over the weekend and I am hooked! BTW where did you get the glassware used? Very chic and modern love the suspended look. 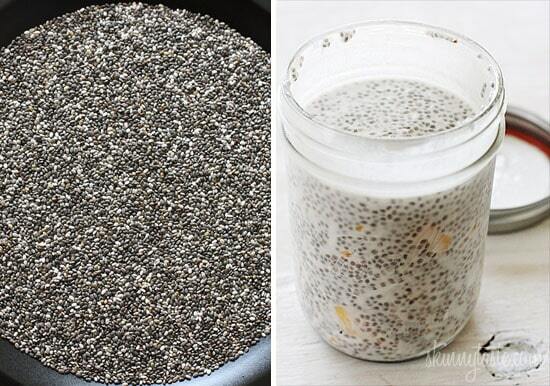 Thank you for giving me another use for Chia seeds…just made this today and it's great. Will definitely make this again. Finally got around to making this. It was everything I had hoped for and more. Thanks for the great ideas! Made this last night for this morning's breakfast. What a yummy way to start the day. And I was amazed that I was unable to finish my lunch today. I have never been known as one who left food over on her plate. This chia stuff ROCKS! i've tried this with mango- amazing! i tried it again, but this time with banana. tastes like banana cream pie filling! i'm going to try it again tonight with pineapple! A+ gina! 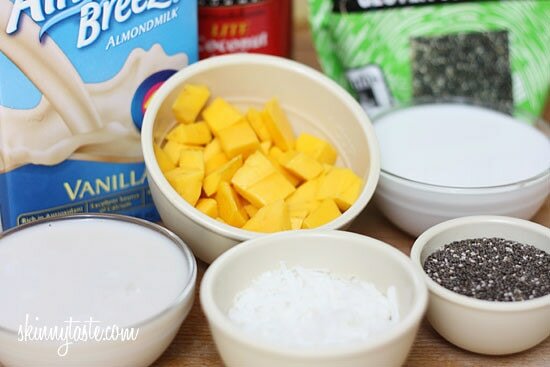 This looks really good, I love and use Chia seeds daily but have never seen Chia Pudding.My first question is….can the Coconut milk be substituted for somthing else? I am NOT a fan of Coconut anything.So I would eliminate the shredded Coconut too. My seceond question is, Could you email me your Over night Oats recipe please? I eat Oatmeal EVERY morning and would love to try this.Thanks…I love you blog and recipes! Sure, use almond milk and leave out the coconut. OMG, made this last night and I am obsessed w/ it!!!!!!!!!!!!!!!!! Thanks Gina!! This was amazing!! I found chia seeds at my local Trader Joe's, and this was my first time cooking with them. 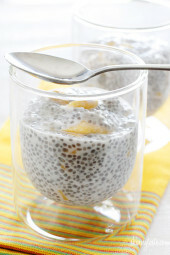 I love the tapioca ball consistency the chia seeds get from soaking in the liquid. Amazing flavors and textures in this pudding! Will be making batch after batch. Thank you Gina! 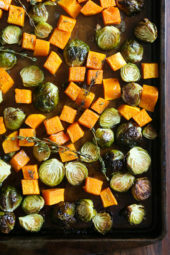 I have always loved cooking, but your website has made it so easy to cook healthy, flavorful meals. My boyfriend has been very pleased with all of the recipes I have made from your website! He thinks I am an amazing cook, and I have you to thank!! Skinnytaste is hands down the best recipe blog I have ever come across. Anyway, I made this once with peaches, and a new batch I made with cherries is in the fridge to have as a little treat after dinner. The recipe on the back of TJ's package works well (basically it's double the quantities). Thank you so much for introducing me to this new-to-me food! I look forward to trying to overnight oatmeal, too, and have, in the 7-8 months since I first followed some link to this blog, have really begun to rely on your recipes to mix up things! Thanks! Just tried this, and it is really good. The chia seeds have a "green" flavor that you have to get used to. Kind of like the first time you add spinach to your smoothie. Once you get used to the green flavor, it tastes really good and healthy. I got chia seeds at the local hispanic market in the section where all of the spices and chiles are in little plastic baggies. It came in a little clear packet with about 2.5 tablespoons for $0.79. Also, I didn't have coconut flakes so I skipped them and it was a little weird not having something to "chew". So I added some almond slivers and it was fantastic. This is a great recipe, but I just have a quick question. I have this sitting the fridge doing it's thing, but there doesn't look like there is enough "pudding" mixture…it's barely enough to cover the mango's. With there only being 1/2 cup of each liquid, how are you getting 2 servings of a cup each out of this? It's been in the fridge for about 3 hours now and I had to sneak a taste and it DELISH! Thanks so much for sharing all your recipes! I've been reading about the nutritional wonders of chia seeds and have been wondering how to use them. This looks delish – I will definitely try it! I just wanted to say thank you so much for sharing such a wonderful recipe! I have been playing with chia seeds as of late and something along the lines of this recipe crossed my mind. This is now one of my absolute favorite recipes! Please keep sharing whatever your creativity comes up with. Ignore any unnecessary criticisms from people who fail to acknowledge that you're kind enough to share anything in the first place. the recipe calls for unsweetened almond milk but the pic shows vanilla almond milk…are they the same? Made this with Almond Breeze Vanilla Almond Coconut milk (sweetened, but added GREAT flavor). Added banana and fresh mango and it was awesome. Thanks for the idea. If you like it fruitier, you could even replace just a splash of the milk with fruit juice or apple sauce. Gina, I've made this twice and LOVE the taste! However, mine hasn't been a "pudding" consistency; it's runny with plump chia seeds.. am I doing something wrong? I noticed that shown in your picture, it is Vanilla Almond milk but it calls for unsweetened almond milk. Which did you use? I think the vanilla would make it taste better because of the added sugar and flavoring. They make a sweetened and unsweetened vanilla almond milk so you could have the flavor with less sugar and calories! I use chia seeds in my morning "mash": 1/2 cup apple sauce, 2 tbls chia seed "gel" (seeds pre-soaked in water overnight), 1 tbl dried cherries, 3 raw chopped walnuts, 1 tbl flax seed meal. Thanks for the pudding recipe! I will definitely give this a try. I have a similar question as the above poster. I get 5 points just for the 2 TBLS of Chai Seeds alone. 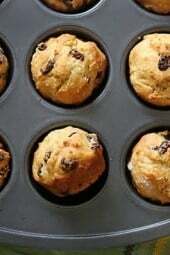 My recipe in recipe builder comes out to 12 points total and 6 points per serving. Any ideas? When I plug this in to the WW recipe builder, I get five points per serving? I put chia seeds in my yogurt, smoothies, and in any baked goods that don't require a silky texture, such as muffins, oatmeal cookies and pancakes. I made this last night and used frozen blueberries instead of mango. It was probably a little more liquid than if I'd used a fresh fruit, but it was still good and very refreshing! I'll make this again, with whatever fruit I've got on hand. It's a great snack or breakfast component. Wow, I just had this for breakfast and I'm hooked. The flavors and textures are so good. I'm going to check out my local Walgreens to see if they carry chia seeds. I was buying at Whole Foods but they're expensive. Glad I real other's comments and realized I could look elsewhere in town. Hi!! I made this pudding with vanilla almond coconut milk but it came out wrong:( i mix it well last night and when I woke up to have breakfast all the chia seeds were in the bottom of the container. What happened? Thanks so much for posting this! It is delicious and I was thankful the recipe is forgiving. I had to improvise a bit based on what I had on hand. I used all light coconut milk, skipped the shredded coconut, used about a teaspoon of agave, used Trader Joe's frozen Mango chunks (just added them frozen) and added an extra 1/2 tablespoon of chia seeds to compensate for thawing mango. So I really like this recipe, but I changed it a bit. I use the coconut milk (So Delicious) that comes in the carton in the dairy section of the supermarket. I also changed it by blending the mango in with the almond milk and the coconut milk. I then add less sweetener because the mango makes the entire mixture so much sweeter. I love doing it this way, so great. Thanks for the recipe and the blog for that matter. Just put two batches of this into the fridge to set over night. Can't wait to try it! May be my breakfast. I like to grind the chia in my coffee grinder and then make strawberry jam: thawed frozen strawberries, a bit of lemon juice, ground chia, and stevia. Sooo fresh and delicious without the seediness of chia. Is the coconut milk that the recipe calls for canned or refrigerated? I just started putting them in my cereal. They're great! I'm going to try your pudding. Thanks!